There’s No Such Thing as a Bad Gift! | What a Beautiful Mess! There’s No Such Thing as a Bad Gift! I know you’re probably thinking…oh yea…what about that bad sweater that Aunt Betty gave me last year, or the gaudy lamp I got from my brother Len a few years back! Well, it may not be your first choice, but it was theirs! As long as a gift is given with love, who’s to judge what’s a good or bad gift. Although you may not need or even want it, at least thank them for their thoughtfulness, don’t judge them as a person by the gifts they give. I think too much emphasis is put on how much a gift costs or where it was purchased from, I like a gift that was made by the person, who took the time and energy to make something just for me. Or someone who spends time trying to find that one item that you lost and always wanted again. There’s no one that hasn’t given a gift that wasn’t wanted by the person receiving it, but it’s ok…..it’s the thought that was put into that gift that matters! I’ve now set up three areas in my home with Christmas decorations! Even the barn has been decked out with Christmas finery! The barn usually sits with very little in it, so it’s nice to put it to use. It’s the Down on the Ranch Barn from Jian. It’s colour change and nice and roomy for that casual party you might want to host!. I’ve set up a corner with a few of my favourite seasonal decorations, from a couple of my favourite creators! 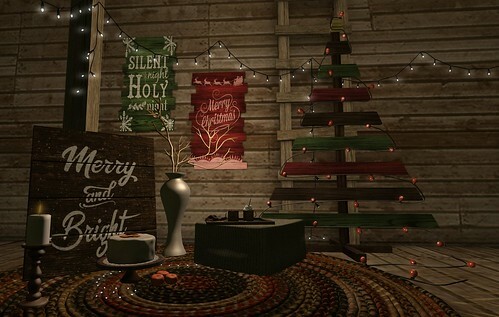 The Rustic Christmas Tree, Classic and the Rustic Wall Art are both from [QE] Designs and available at the main store. Both have multiple colour and design options via drop down menu, and are 100% mesh!! And, Raindale has released an incredible variety of seasonal items including the winter vase, the Bright and Merry wall art, and string lights, just in time for Christmas! The lights come in the mirror(seen here), along with blinking, coloured, and colour change via HUD. All are available now at the December round of 2nd Level. While you’re there remember to grab the gift from Raindale….it’s the Tangerine Cake and little decorative string light with it. Also, there’s more, the candle is a gift at the Raindale main store…..so many gifts this time of year! I’ve added the Warm Winter tray and puf from the Winter Warm set from Serenity Style that was part of the release for the December round of Deco(c)rate. I’ve been enjoying all the decorating the winter season brings! Under all of this is the Simple Elegance Mesh Braided Manchester Rug from StoraxTree.